CCThe marina at Squalicum Harbor, in Bellingham, WA, is a great place and we have used it for most of exploring of the San Juan and Gulf Islands and as a launch site for Alaska. 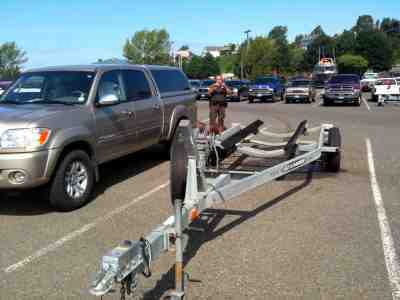 CCThere is a long-term parking lot for trucks and trailers that is regularly patrolled by the marina security. We have used it for all of our launches. This time, while in the San Juans, we were in for a surprise. 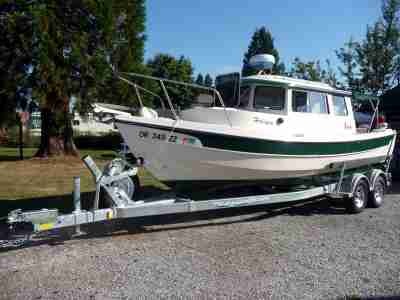 CCWhen we bought our Halcyon back in fall 2000 she came with a nice EZ Loader trailer. We used her for our travels around the US and she was a good and faithful friend. We had her totally serviced once a few years ago and replaced her brakes once at that time. This past year, while in Bellingham, we replaced all four tires. The tread was still fine but we wanted to be sure that the rubber was in good shape and maintain her in good operating order. CCThis summer, while in Bellingham as a launch point for cruising in the Northwest, we left her in the long-term parking at Squalicum Harbor. She was unhooked from our truck, since we had just gone shopping in town for provisions. There was a strong brass lock sealing closed her loading ball and the brakes would lock without proper connecting. Imagine the surprise to find her gone on our return. Well that began the filing of police reports and insurance claims. We ordered a new EZ Loader trailer from a local store, essentially the same as our stolen trailer. The day the new trailer arrived, we received a call. CC"You the folks with a missing trailer?" the authoritative voice on the line asked. CC"Well, this is the police. We found it. In a drug bust. Saw this big boat on a small trailer in their yard, so checked out the trailer. The fenders and guide rails were torn off in order to fit the large boat. It's been hot-wired and the lock's gone. The VIN number and all identifying decals that you reported were also missing, but we found another VIN the bums didn't know about. It's yours. When should we deliver it to you at Squalicum?" CC"We're here all day," we answered. "Good police work. 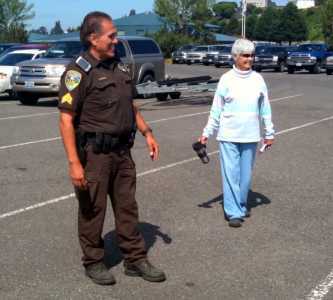 We never expected to see it again, and the officer that took our report said the odds were thin it would be recovered." CC"Thanks, we'll bring it over in an hour. 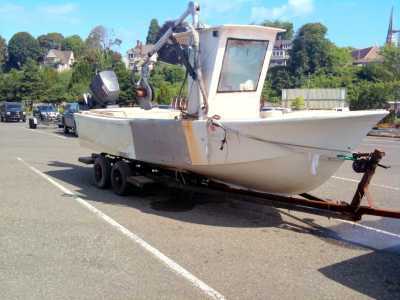 Gotta drop off the big boat that's on it at the ramp - those buzzards won't need either the boat or the trailer where they're going." CCThe case was solved for the police and the insurance company. But now we had two trailers - our old stripped down buddy and the new kid on the block. Serendipity struck. Our old adage, luck in unluck came through. That very morning, before we knew our old trailer had been found, we had received an email from a good friend. The email had Lake Powell as the subject. C "I have a question for you. 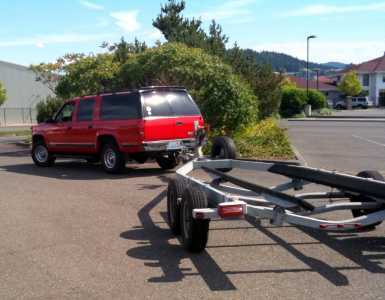 My trailer is a single axle, and I don't feel very comfortable pulling the boat 2500 miles on it. I would really like to have a duel axle, and wonder what your thoughts on this are, plus, what brand trailer did you end up buying in Bellingham? It was great seeing you in Bellingham, and would love to do Lake Powell with you guys." CCAs the policeman left the ramp parking lot, with the thieves boat in tow, we remember the email, looked at each other, and said in unison, "Solved." We called our friend, asked her if she would like our ol' trusty sans guides and fenders. 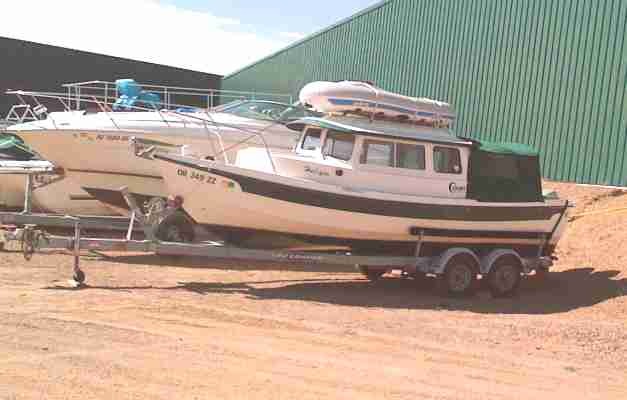 For relatively little cash outlay she would have the double axle she needs to head to Powell. CC"Really? You got it back? You're offering it to me?" CC"Be there in a couple of hours."